The Eurocrypt Conferences are a series of annual meetings on high quality research in cryptology which focus on the latest developments in this topic. 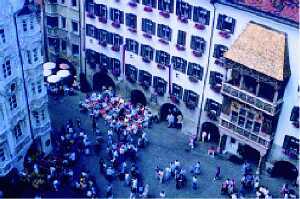 The International Association for Cryptologic Research (IACR) organizes these conferences in cooperation with local partners - in 2001 as the conference location will be Innsbruck (Austria), together with the Austrian Computer Society (OCG). Bring your notebook and a NIC and connect it to the LAN at the conference site!